Emily Eden's The Semi-Detached House (1859) is a very engaging and entertaining read. 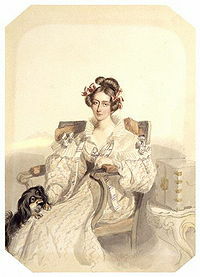 Many readers have compared Eden with Jane Austen and Elizabeth Gaskell. Eden, who was the seventh daughter of William Eden, 1st Baron Auckland, and his wife Eleanor Elliot, renders a whimsical comedy of manners and satirizes the domestic sphere. 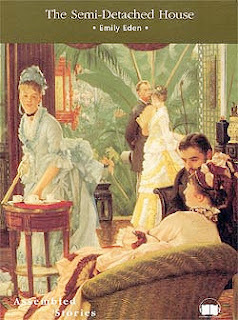 The novel starts as Lady Chester, who is expecting her first child, moves into "the prettiest villa" to be near her Aunt Sarah and Cousin Blanche while her husband, Lord Chester, is away on a special mission to Berlin. The house that has been contracted is "semi-detached," or what would be referred to as a duplex in the U.S. A bit of snobbery creates the initial tension with the neighbors, who consist of the wife of a sea captain who has become wealthy with frequent merchant voyages to India, and her two daughters. The father / husband is still away on his sea voyage. In the meantime, various characters are introduced and they interact in ways reveal the daily lives and concerns of middle class society and the gentry. There are many characters in The Semi-Detached House, and the represent a kind of cosmology or tableau vivre of society. There are rogues (the Baron Sampson) and the mobile middle class. However, as opposed to the protagonists in Austen and Gaskell, in Eden's narrative realm, the reader does not plumb the depths and explore the inner landscape of the main characters with all their contradictions and longings. Instead, Eden's omniscient narrator observes all the characters and their interactions, but does not establish such extreme intimacy. Thus, there is not the episode of awakened self-awareness (accompanied by an epiphany of shame and self-recrimination that you would find in Austen (I'm thinking of Pride and Prejudice and Northanger Abbey). Nevertheless, Emily Eden's characters are quirky but not to the point of farcical, and as a comedy of manners, the novel effectively satirizes behaviors and customs. While Eden does discuss social situations as impacted by the economic context (bank crisis and swindlers), she does not go as deeply into the vast changes brought about by technological and socio-economic change as she does in the case of My Lady Ludlow and North and South. For me, Emily Eden is something of light-hearted and modest antecedent of some of Anthony Trollope's work, namely The Way We Live Now (according to many, his masterpiece), in the sense that it satirizes society and the types of people bred by them. Eden's later work, The Semi-Attached Couple, is a darker look at human nature in relationships, replete with the pain of misinterpretations and gossip. Eden, who spent time in India, also wrote letters that chronicled her travels. The book, Up the Country is available via Project Gutenberg. Her Letters from India are available atA Celebration of Women Writers.